Ypsi-based rock duo Junglefowl will debut their new EP "Strut" this weekend in a record release show at Crossroads Bar and Grill. Having received a super-secret sneak preview of the new album, we at Damn Arbor can testify that it's packed to the gills with badass female vocals, fuzzed-out guitars and the kind of two-person garage-rock punch that can't help calling to mind the White Stripes. We've known vocalist and drummer Melissa Coppola as a folkie for her past work in Match By Match, but who knew she could rock this hard? Jam the single here, then go buy the record and hear all the new tunes live on Saturday. Plus all proceeds from the door benefit the excellent nonprofit Girls Rock Detroit. What more can you ask for? 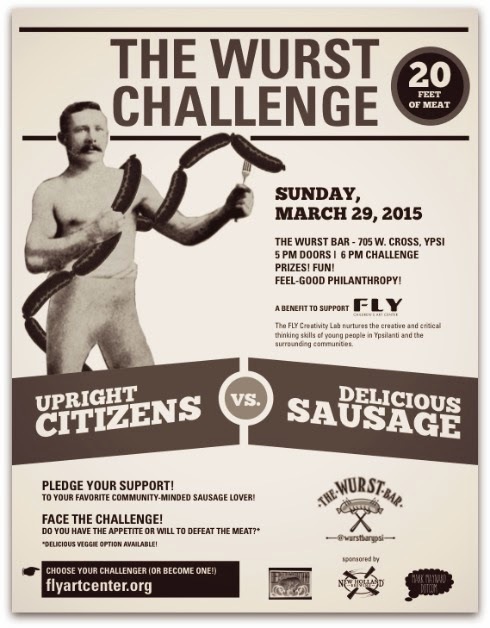 Gentle Readers, the second annual Wurst Challenge is this Sunday at the Wurst Bar in Ypsilanti. 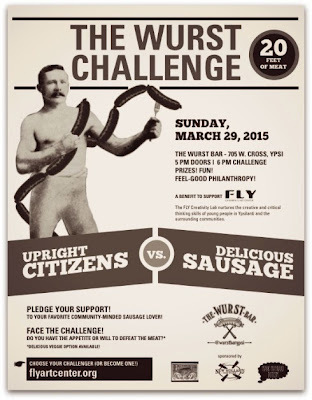 EJ and I went to the Wurst Challenge last year and it was super fun. This year's event promises not to disappoint. The nice folks at the Ann Arbor Observer have a short preview for the Film Festival, here: "Ann Arbor Film Festival: The art of the wait". Gentle reader, check out these slick maps showing the results of Ann Arbor's helicopter deer counts. As you can see from the map from March 6th 2015, it looks like 5 deer were spotted in the vicinity of Packard and Wells. Am I reading that right? 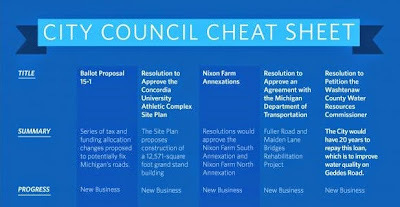 Check out the Daily's awesome cheat sheet for tonight's #a2council meeting. Click here for the entire card. The 53rd Film Festival runs March 24-29th. It'll feature hundreds of films, videos, and live performances from around the world. 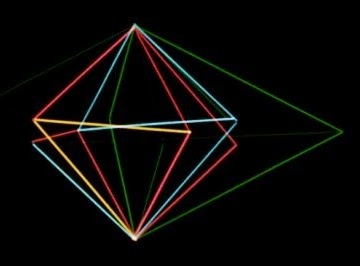 Given my personal propensity for computer-involved art, I'm particularly looking forward to the Computer Age presentations on March 25th (1953-1969, 1971-1987). 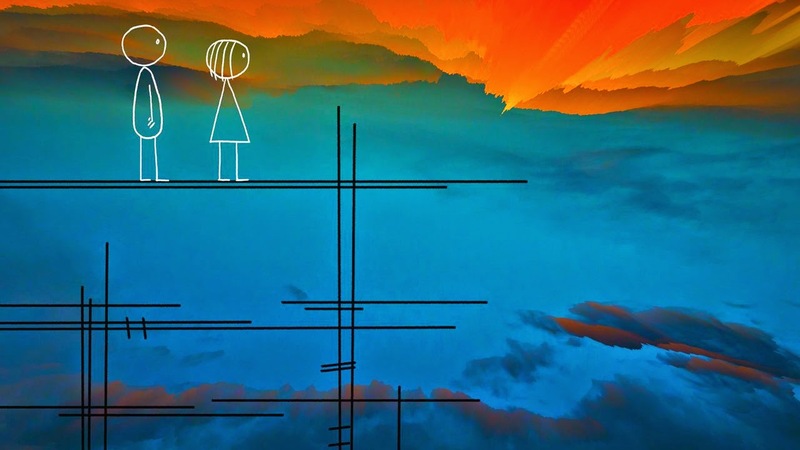 I had the pleasure last Wednesday of seeing Don Hertzfeldt's delightfully surreal World of Tomorrow, and so I can highly recommend that you do the same, on March 27. The festival isn't all films! I'm super excited to check out Jane Cassidy's installations at Work Gallery, which opened yesterday and will run into April. And I could go on about other things I want to see, but instead I'll point you, gentle reader, to the schedule to peruse for yourself. 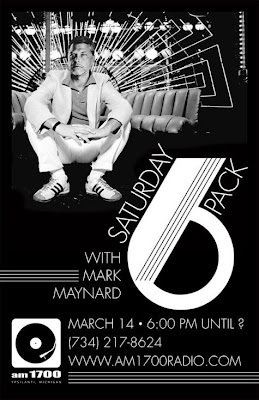 Gentle reader, tonight I will be making my radio debut on Mark Maynard's Saturday Six Pack. I'll be on after State Representative Jeff Irwin and local historian Matt Siegfried. Gentle reader, you should see Sebastian Gerstner in Theater Nova's Buyer and Cellar. It is a hilarious one-man show about an unemployed actor who lands a gig working in the fake mall in Barbra Streisead's basement. Yes, Ms. Streisand has a fake mall in her basement. Watch the clip of her promoting her design book on Oprah. Buyer and Cellar dares to ask: "what if someone worked in that basement mall?" Sebastian does an outstanding job in the show. I couldn't help but feel like I was spending a lovely evening with a friend recounting his halarious story of working for Ms. Streisand. Beyond the great acting, I think Jonathan Tolins' play really does a great job capturing our complex feelings about Ms. Streisand: a talented performer who has a reputation for being a bit controlling at times. Gentle reader, I can't recommend Buyer and Cellar enough. Theater Nova is doing a great job making a theater space at Yellow Barn. Also, tickets are pay what you can, so you really have no excuse not to go. Hi DTE, how are you doing? I saw that you decided to withdraw your proposal to build Michigan's largest solar array at the Ann Arbor Municipal Airport. Guess you guys didn't want to deal with the inter-municipal angst between Ann Arbor and Pittsfield Township. Well you know who would just love a solar array? That's right, Washtenaw County's oldest municipality, Ypsilanti. In fact, if you decide to put your solar array here, we can even add an extra verse to Lee Osler's classic, Back to Ypsilanti, about how Ypsilanti has Michigan's largest solar array. Just, you know, something for you to think about DTE. Will Leaf, who you may remember from the Mixed Use Party has pulled petitions to run in Ward 1. Former Ward 2 Council member, Sally Hart Petersen has pulled petitions to run in Ward 2 again. This means we could see a rare competition in the November 2015 General Election if current Ward 2 independent Council member, Jane Lumm, runs for reelection. Ward 3 Council Member, Stephen Kunselman, is the only candidate who has submitted completed petitions to the city clerk. Good on you, CM Kunselman. Another newcomer, Zachary Ackerman, will be running in the Ward 3 primary. Ackerman is an Ann Arbor native who graduated from U of M in Dec. 2015. He has worked on several political campaigns including Christopher Taylor's mayoral campaign and Debbie Dingell's Congressional bid. Kunselman has deftly defeated past challenges from recent U of M grads, so it will be interesting to see if Ackerman can put his political experience to use in his city council bid. This could be an exciting election to watch. At this point, Jack Eaton is the only candidate who does not appear to be facing a challenger in the August primary or the November general elections. 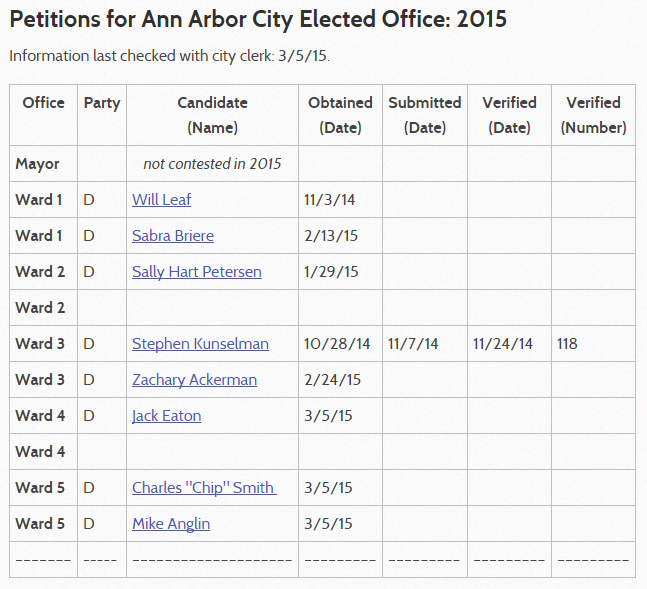 In the Fighting Fifth, both Chip Smith and incumbent Mike Anglin have pulled petitions to run. Anglin has held the seat since 2007 and never received less than 65% in the primary or general elections. Still, Chip Smith's late breaking 2013 write-in campaign was able to capture over 30% of the vote in Ward 5. This is the election to watch folks. Ward 5 tends to have much higher voter turnout than the other wards. Also, Chip Smith's 2013 campaign was notable for being the first local campaign to feature youtube videos and facebook ads. Gentle reader, are you getting excited for the local election season? The Ann Arbor Summer Festival has announced the movies we'll see this summer. This sounds like a really fun season; I can't wait! The city is planning to entirely rebuild Stadium Blvd. in the S. Main St. area in 2016 and 2017. This is a massive project, and I won't try to describe it all here; instead you can read about it on the city's website. A public meeting was held at Pioneer HS on Wed, Feb. 25, to present a preliminary design and gather feedback from the community. Several city staffers and councilmembers were in attendance, alongside 20 or 30 community members. This was the second of three public meetings to be held on the project. Slides from the presentation are available here, and I'll try to recap some of the highlights from the discussion here. I'm particularly excited about the bike lane which will be constructed along this stretch of road. Notably, the city is considering a combined right turn/bike lane at Main St. on westbound Stadium, which provides a safer environment for cyclists (and is how I tend to use most right turn lanes when cycling, regardless of markings). I'm pretty excited about that. The scheduling for this project is specifically being planned to avoid disrupting the football and basketball seasons. This construction isn't going to address the flooding issues present in the area northwest of the Stadium/Main intersection. However, construction in that area is at least designed to make future improvements possible, and the water-pooling issues that currently affect Stadium itself. In case you missed this news from Wednesday's DDA meeting, they've shelved the ambassador project for now (link is to MLive, with a more thorough article). But there are still downtown neighborhood associations (the South University Area Association and if I recall correctly the State Street Area Association) pushing for a similar program, so we should keep paying attention, and we should keep providing feedback to the DDA. And you should also join this Ann Arbor Ambassadors Facebook group. There are thirteen characters in Performance Network Theater's production of Stones in his Pockets, directed by Suzi Regan. Charlie Conton (Wayne David Parker) is an excitable extra--and aspiring screenwriter--in the Hollywood movie Quiet Valley, set in and featuring heavily a romanticized version of the Irish countryside. He strikes up a friendship with Jake Quinn (Andrew Huff), another extra who is smarting from a recent failure to reinvent himself in New York and grappling generally with life's broken promises. There's also Simon (Wayne David Parker holding a walkie talkie), the first assistant director who's just trying to get the movie finished on time, and Aisling (Andrew Huff in a headset, leopard-print glasses, and an irritated expression), a young woman paying her dues in the film industry. There's an aging extra Mickey Riordan (Andrew Huff in a newsboy cap), the movie star Caroline Giovanni (Wayne David Parker in a head scarf), and Sean Harkin, a disillusioned local kid who commits suicide halfway through the play (Andrew Huff in a grey knit hat). Maybe you get the idea? Tonight, two great shows are opening in Ann Arbor. 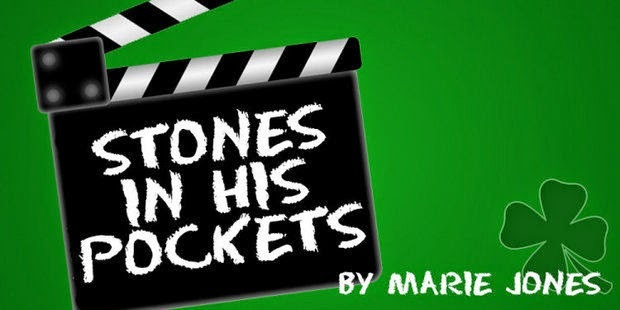 Stones in His Pockets opens at the Performance Network and runs through April 5th. At Theater Nova, Sebastian Gerstner is starring in the Michigan premiere of Buyer and Cellar. In this one-man show an unemployed actor who finds work manning the mall in Barbara Streisand’s basement, which is a real thing I guess. You should definitely check out this show as Sebastian is one of my absolute favorite local actors. 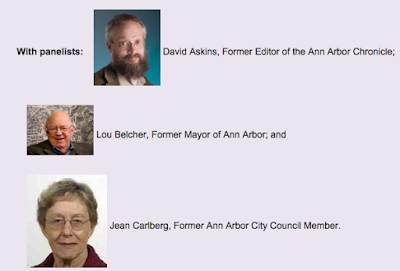 Tonight at the AADL: Ann Arbor Elections: What works? What doesn't? 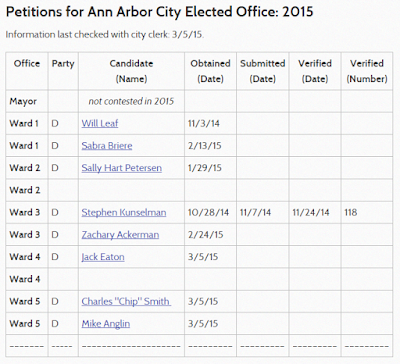 Did you know that Ann Arbor is one of only three cities in the entire state that holds partisan city elections? The other two are our neighbor Ypsilanti and the City of Ionia. Wonder why that is? Is it because it is a better way or are there other reasons? LWV-AAA intends to explore that very issue in a mini-series of forums beginning this spring. On March 3rd we will begin the conversation with Ann Arbor Elections: What works? What doesn't. I know Dave Askins has been working on cranking out a lot of graphs and charts for his presentation tonight. You really don't want to miss that. CONCENTRATE: The downtown ambassadors program has caused lots of controversy. People have said it doesn't fit with the character people want to see in their downtown, and that it seeks to solve a problem that doesn't exist. Do you understand that criticism, and what is your reaction to it? RH: We definitely heard the criticism. We are going forward at a very measured, careful pace as a result of it. There was a lot of misinformation about what the program was going to do, and I don't know how that information got out. Most of the commenters, if you read them, hadn't read any of the information that we put out about the program. And these are programs that are throughout the nation. We've identified at least 70 downtowns that have this program, including Berkley, and they seem to be quite happy with it there. Before we do anything on ambassadors, we need to to explain exactly what we're trying to do with this program, which is, basically, help people at all levels. Whether you are a panhandler on the street or whether you are parents bringing a student in, it's someone there to offer some help if you need it. To me, it's a very fundamental Ann Arbor value. I think there is somewhat of a disconnect between what goes on in the campus area and what goes on in the Main Street area. I don't think everyone understands the different cultures of the two areas. [The problem the ambassadors program is seeking to solve] is primarily in the campus area. So people are not seeing it. At night, particularly later in the evening, there is a fair amount petty crime that goes on that would make an extra set eyes on the street helpful. I think there are more homeless people in the campus area and a number of these people need help. Both the boards of the State Street Association and the South University Association unanimously support the ambassador program. But we certainly have heard people, and we certainly aren't going to ram anything down people's throats. We are certainly not going to start negotiating a contract until the community has a good understanding of the program and at least a majority of people support of it. The widespread criticism of the program has worked, sort of. Hewitt seems to discount some of by classifying it as "misinformed." Still, they don't want to "ram anything down people's throats." So keep those comment cards coming and attend DDA meetings and speak during public commentary if you can. Seems like the DDA Board is responding to a lot of pressure from the South University Association and the State Street Association boards. How much do those boards represent the businesses in their regions? How many people are on those boards? How can we influence those board members? How much should the DDA respond to the Down Town Neighborhood Associations relative to regular citizens? It still seems like the Ambassador Program would be used to get "eyes on the streets" in order to prevent minor property crime, "aggressive panhandling," and direct homeless people to services. Why do we need to hire a shady outside corporation to do this? Couldn't the DDA just spend the $300k per year to hire an extra police officer or two and some social workers? The DDA at a turning point?